If you are like me, you avoid plastic as much as possible. BPA contamination scares you. You only drink from [amazon_link id=”B003BFYZE8″ target=”_blank” ]reusable glass[/amazon_link] or [amazon_link id=”B0010EMTU4″ target=”_blank” ]stainless steel water bottles[/amazon_link]. If you are like me, you shop in bulk to save money and reduce packaging. Could bulk food be contaminated with BPA from the bins? Polycarbonate has become a bit of a dirty word because of the reality of Bisphenol -a other wise know as BPA. This was a necessary component to make polycarbonate until the advent of a new process by a company partnered with Trade Fixtures and ultimately us here at Brencar. Even though BPA was never a concern where bulk food bins were concerned, we have taken a proactive approach to the situation through several years of testing, analyzing and making certain that we can say with all confidence that we are now able to provide a BPA-Free polycarbonate bulk food bin that has all the same clarity, strength and toughness consistent with all of our products and that thousands of store owners around the world have come to expect and trust. I don’t really understand the statement that “BPA was never a concern where bulk food bins were concerned” and wish that it had been clarified. If bulk bins are traditionally made from polycarbonate, and polycarbonate is made with BPA, then why wouldn’t it be a concern? Maybe it is because bulk items are mostly dry goods so their contamination is less? Or maybe this vendor believes BPA is safe. Bisphenol A (BPA) is a key building block of polycarbonate plastic. In recent years a number of researchers from government agencies, academia and industry worldwide have studied the potential for low levels of BPA to migrate from polycarbonate products into foods and beverages. These studies consistently show that the potential migration of BPA into food is extremely low, generally less than 5 parts per billion, under conditions typical for uses of polycarbonate products. Perhaps newer bulk bins are made with a BPA-free polycarbonate, but I would assume the older ones in your coop or health food store may contain BPA. 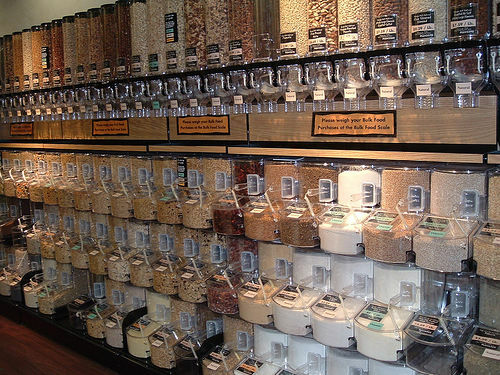 Some bulk bins are made of acrylic, and these are BPA-free. I plan to ask next time I shop. probably the wrong attitude, but at some point I can’t worry about it. I keep out of the reach of hot foods and liquid food storage and dry goods as much as possible, but I don’t expect my retailers to start from scratch on their bulk bins. Maybe in a remodel, but not in thousands of dollars of bins. The environmental impact of that nationwide would be crazy. Yes, not recommending remodels, but it is just another possible source of contamination.